In mid-May we finally threw off the mooring lines and sailed down the Brisbane River to continue our journey north up the Queensland coast. 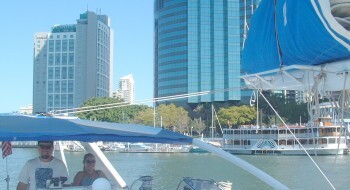 Brisbane was a fabulous city to "season-over" in. At first there was the bustle and excitement of the holidays with free Christmas concerts, New Year's fireworks, and Chinese New Year parades. Over the weeks we learned of the best fruit and veggie markets, hardware stores, boat chandleries, bookstores, coffee shops (yes, there's an espresso shop on just about every street corner!) and bargain clothing. That being said, Australia is actually not the bargain it once was, given the falling US dollar, so watching the money flow was a constant issue. After the road-trip mentioned in our last newsletter, it took us 2 months to get back into cruising mode. We had a damaged car to repair and sell, which we eventually did, passing on an improved 17 year old station wagon and all our camping gear to 2 Korean backpackers. Meanwhile Ocelot was given LOTS of attention. We replaced the hand basins in all 4 heads (some were showing signs of rust, so we had new ones vacuum formed to the exact size). We did engine maintenance, had the dinghy engine overhauled, and the biggest job was re-rigging the cap-shrouds (thick stainless steel cables that support the mast). Sue had a hurt knee which had her limping around town and up the hill to the medical centers about 5 times. Why are medical centers always on the tops of hills? Jon had to rescue another catamaran whose propellers were so badly fouled from sitting too long in the river that they couldn't navigate (Jon actually rescued about 4 yachts for one reason or another during the time we were up the Brisbane River). So we checked Ocelot's props by running hard forward and reverse against our mooring lines to make sure they weren't too fouled to use. They seemed fine and we were relieved not to have to dive in the zero visibility, strong currents, and bull shark-infested Brisbane River. 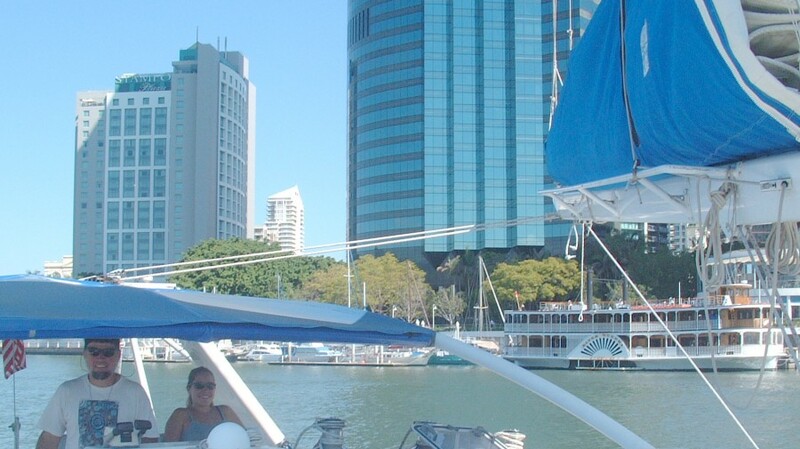 We had a delightful 2 hour sail down the winding Brisbane River, past all the high-rises, expensive homes, quaint shops, boating activities, and finally the big shipping port. This put us in expansive Moreton Bay, bordered to the east by Moreton Island with its low scrub forest and white sand blows (what the Aussies call a sand dune on a foreshore). We anchored up against Moreton Island at a place called "Tangalooma Wrecks" (we LOVE the names here) where about 20 rusted ship-hulks have been grounded to form a breakwater - very eerie. The next morning we were sailing north under bright skies and our black, orange, yellow and red spinnaker when suddenly, Bang! The leeward sheet was flung back on deck and the sail started flailing. 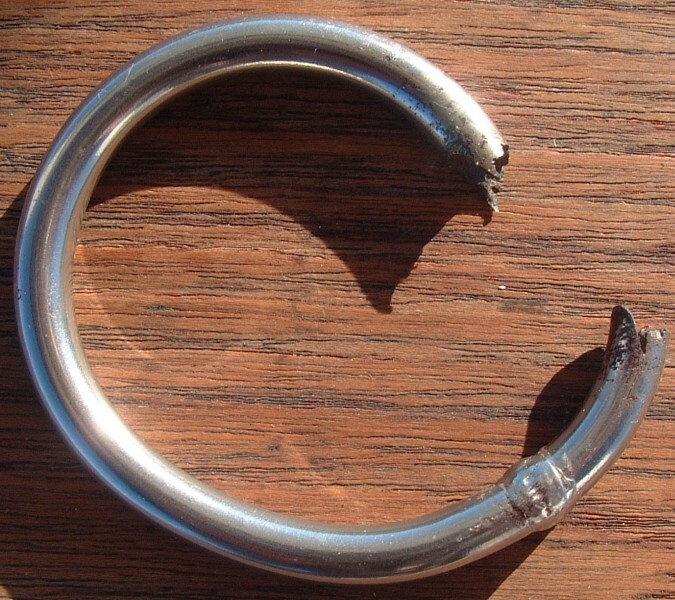 Amanda and Jon hauled the chute down to find that the 1/4" (6mm) stainless steel clew-ring had broken(!) and the razor-sharp edges had ripped the corner of the sail. With the promise of many weeks of light following winds up the Queensland coast and in Indonesia, we decided to get it fixed ASAP. So we ducked into Mooloolaba, about 35 miles north, where cruising friends greeted us and guided us up the river past million dollar homes, each with its own dock and yacht! A week in Mooloolaba was a pleasant change from the Brisbane river. We had 3 sets of cruising friends to visit with, including land-based yachties we hadn't seen in 3 years. We enjoyed lots of socializing, including a nice dinner ashore to celebrate Sue and Jon's 27th wedding anniversary. 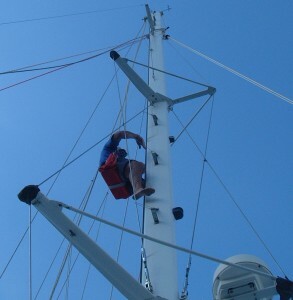 While the sail was being repaired we took the opportunity to get our 8 person life raft re-certified -- i.e. unpacked, inflated, repaired, recharged, restocked with water, food, lights, flares, and medicines, vacuum sealed and re-packed. We took Ocelot to the outside beach one day to do some preliminary hull scrubbing, but the cold and the surge was so great Sue almost got sea sick while swimming! Note their air bubbles as they breathe! About 60 miles north of Mooloolaba the land makes a big hook to the south, and behind that headland of sand blows and forest we found a calm, clear water anchorage. It was the first time we'd seen the ocean floor under the boat in 6 months! 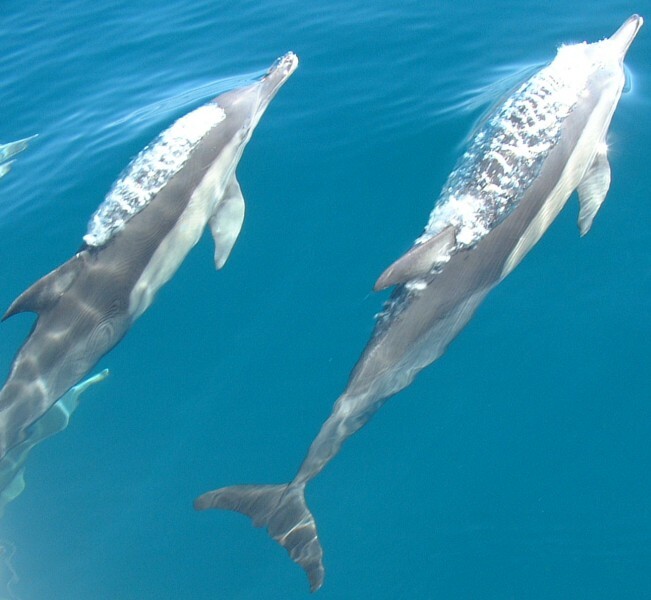 The next day there was no wind, and the sea was so flat that as we motored north from Double Island Point we could photograph dolphins underwater as they played in our bow-waves. We entered the infamous Wide Bay Bar at the southern end of Great Sandy Straits (Fraser Island) at low tide - Not the best time, as the bar breaks erratically far out to sea, but with such calm conditions we were fine. We never saw less than 9' (3m) of water under the hulls. We spent a lovely 3 days and nights in the Straits, anchoring up against Fraser Island (a World Heritage site and the biggest sand island in the world) each afternoon. By day we motored the tricky passages, always on the lookout for the next red or green buoy (sometimes miles apart) and wary of the shoaling water which can strand even shallow-draft boats after a moment's inattention (we watched it happen to others). Once the hook was down we'd walk the beaches and forest trails, carrying sticks to protect ourselves should a dingo pack approach us. Although we'd hoped to see these golden wild dogs we never did, but we did see several dolphins, turtles and dugongs in the water. On the shores egrets waded while white and bronze Brahminy kites hunted overhead. A light south-westerly breeze came up on May 29 and we crossed Hervey Bay by daylight, dodging commercial fishing lines that were strung for a mile or more. 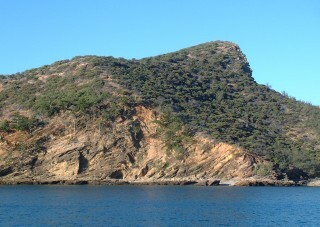 We carried on through the night and the next day, passing Capricorn Point which marked our entry back into the tropics. Could have fooled us as we stood watch in long pants, fleece jackets and socks! We made a welcome landfall at Great Keppel Island where we spent 2 nights, both to rest and to enjoy the company of 2 cruising boats we'd known in Brisbane. From Great Keppel we coast-hopped with our friends for 2 days with stops at the uninhabited inlets of Port Clinton and Island Head Creek. These are military zones and sometimes off-limits to yachts (but the military seems to be in East Timor these days). Going ashore is not only prohibited, it's potentially dangerous as we were now in saltwater crocodile land! The anchorages were beautiful, with mangrove and sand-hill rimmed shores under 600' (200m) green and rocky peaks. The tides in this part of the coast can reach 25' (8m) and it was always intriguing to see the receding water expose vast sandy beaches. The last few days we've had several marvelous off-the-wind rollicking sails of 35-60 miles, bringing us to Northeast Percy Island, Scawfell Island, and Thomas Island in the Whitsundays. These beautiful hilly islands are not part of the Great Barrier Reef but are "continental islands" in that they were formed from the continent itself. With their rugged rocky shores, deep bays, clear water, and pristine beaches they remind us somewhat of the islands of the Pacific Northwest. Sea eagles, osprey and Brahminy kites hunt from the snags, loggerhead and green turtles float near the boat (we can hear the puff of their breath!) and pods of dolphins (some with half-size young) swim under our bows. Yesterday we brought aboard the largest fish ever to grace the cockpit of Ocelot. It was a 51" (1.3m) long, 42 lb (19Kg) Spanish mackerel from which Jon carved 28 lbs (13Kg) of boneless fillets! We'll be eating well for a long time! From Thomas Island we had a rollicking good sail (averaging over 9 knots) to Airlie Beach, the first town we've visited in several weeks. 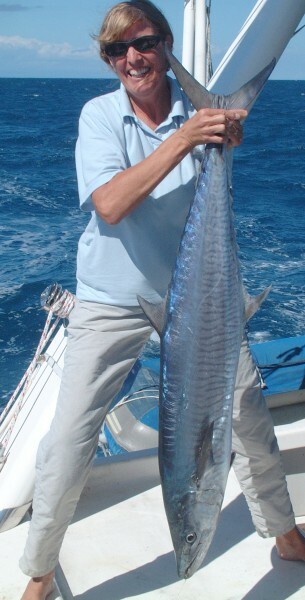 We're looking forward to time with old cruising friends who own Queensland Yacht Charters. They helped propel us into this great sailing adventure by loaning us a charter boat back in 2000 so we could see how the kids liked it, right here in the Whitsundays. It was a monohull, which made us realize we really wanted a catamaran! Our current plans are to visit more friends in Townsville, then continue north to Cairns and Lizard Island, which is supposed to be beautiful and provide excellent access to the Great Barrier Reef. Then we'll continue north up the York Peninsula and around to Darwin to join the Darwin-Indonesia rally in the next month.